Oftentimes people will spend the majority of the party with a cup in hand, so make sure you supply them with a cup that’s stylish, fun, and remembered. Lime Green Plastic Cups are bright, vivid and will brighten up any party or gathering while our classic Green Cups are perfect for any Christmas bash. Each cup is built with a rigid exterior designed to make it easy to hold on to. Easy to hold on to, and even easier to throw away! So once your party is done, you'll be able to take less time cleaning up and more time sleeping those drinks in our cups off. 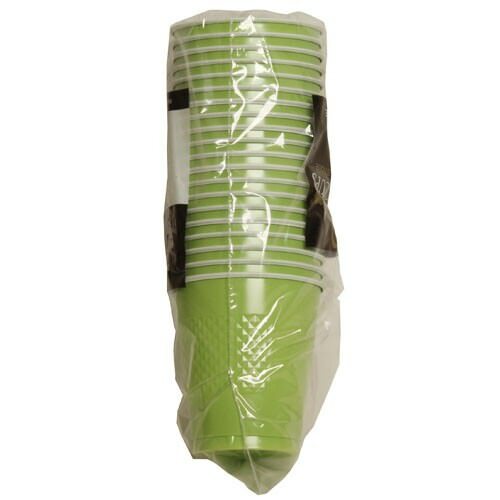 Green Plastic Cups come in sets of 20 and hold 12 ounces. These are available in Lime Green and classic Green. Loving the green and want your party supplies to match? Check under 'Other JAM'n Products You Might Like' for a sneak peek at our assortment!